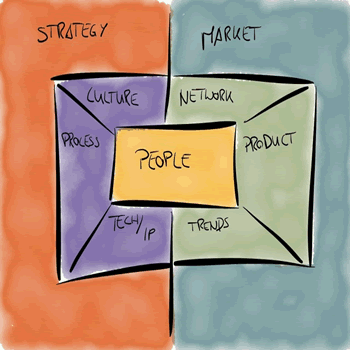 The Open Innovation Canvas was developed by the team of Insight Innovation. It shows the nine building blocks that are necessary to plan your whole Open Innovation efforts or just a single Open Innovation project. It enables innovation teams to make sure their efforts are holistic and effective. If you want to try it out without entering your email address, please use our public Open Innovation Canvas Demo for a first impression. This block should reflect our existing strategy and strengths (DNA of the company) and specify the specific goals behind an effort or project. Which DNA is the basis of all our actions? Are values and goals such as innovation and openness anchored in our strategy? What do we want to achieve with this effort or project? The block "Market" describes the target market for a company or product, as well as any markets that could introduce new knowhow, technology or ideas into our markets. How well do we know our markets and their environment (competitors, legal and sociocultural framework conditions)? Which target groups do we address in our markets? Are there new markets that influence our markets? Are there new markets where our know-how would be interesting in? In "Trends" we look at the trends that influence our industry & markets and investigate how we are making use of these trends. Which trends (political, economical, social, technological, environmental and legal) influence your products, company and markets? How do we gather trends from our environment? Do we observe and assess trends systematically? How do we utilize these trends regarding to our strategy, technology and IP, processes, networks and products? The block "Product(s)" looks at the products and services we are already offering or want to offer to the market. Which value do our products deliver (value proposition) and which needs do we fulfill with it? Do the values of our products complement each other? Where are our products on the Technology S Curve? Which roles do technology push and market pull play for our products? Which technologies, IP and knowledge do we use for our products? Where do we get them from? "Network" looks at all partners we might be working with during the development of our products and the activities we push inside these networks. Which partners do we have in our network and which roles do they fulfill? Which partners could support our network reasonably? Which processes for scouting and partner treatment do we foster? "Technology" visualizes the technology and intellectual property we might already have or need in order to successfully develop our products. We also look at how we work with these. Which technologies or IP do we have or need? Who brings new technologies and IP into our organization? The block "Process" takes a look into all the innovation processes we might have in place and all the processes we need to connect the different building blocks in our model. How do the processes for product development, idea management and business model development look like? Do the processes connect our people, our knowledge and our networks with respect to our culture and strategy? How does our innovation controlling look like? When and how are external partners (customers, supppliers, research facilities, competitors) and their knowledge included in the product development process? "Culture" describes shared values, mindsets and visions of our people and their tie to our processes. Is there a common appreciation of values, behaviour, norms and attitudes? Which possibilities do we offer our employees to work creatively, across departments and with self-initiative? How important are technology orientation, market orientation, entrepreneurial orientation (Intrapreneurship) and orientation towards learning in our organization? Which role plays failure inside our organisation? Is our culture mirrored in our processes? The block "People" describes all the departments, teams and individuals that are needed within and outside of our organisation. The people have to represent all the connections between other building blocks. Which organizational roles and responsibilities are assigned? Are there persons in the company which represent defined points of intersection with our network? Which roles do people have that operate outside our network?